Editor’s note: this transcript is based on the webcast recording of the Symposium. I am grateful to Dr. Robock for sharing his slides with me. 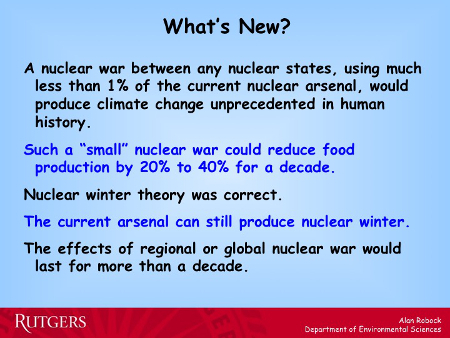 The super-set which these slides came from can be found at http://climate.envsci.rutgers.edu/robock/talks/NuclearWinter67PublicLecture.pptx. The original webcast recording can be found inside: http://totalwebcasting.com/view/?id=hcf. Left-mouse click the local file recording here at – <DPNE-AlanRobock022815.mp3> – to download the mp3 file to your machine. This presentation of Dr. Alan Robock was recorded on 28 February 2015 at The Dynamics of Possible Nuclear Extinction Symposium, presented by The Helen Caldicott Fondation, at The New York Academy of Medicine. The next speaker is Alan Robock, Distinguished Professor of Climate Science in the Department of Environmental Sciences at Rutgers University. Professor Robock has published more 350 articles on his research in the area of climate change, including more than 200 peer-reviewed papers. 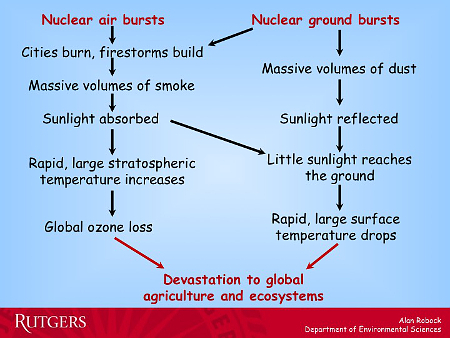 His areas of expertise include geo-engineering, climatic effects of nuclear war, effects of volcanic eruptions on climate, regional atmosphere-hydrology modeling, and soil moisture variations. 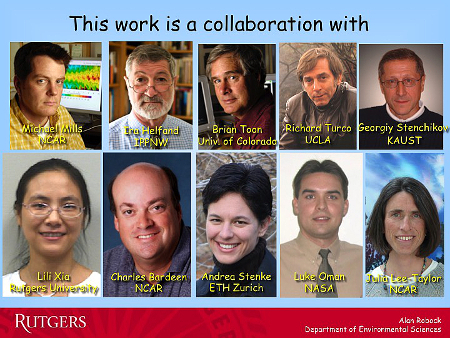 He serves as editor of Reviews of Geophysics, the most highly cited journal in the U.S. sciences. His honors include being a Fellow of the American Geophysical Union, the American Meteorological Society, and the American Association of the Advancement of Science, and recipient of the AMS Jule Charney Award. 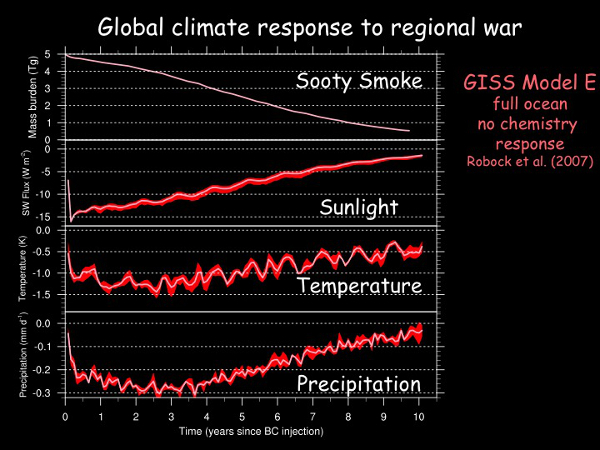 Professor Robock is a lead author of the 2013 Working Group 1 for the Fifth Assessment Report of the Intergovernmental Panel on Climate Change which was awarded the Nobel Peace in 2007. His title is “Nuclear Famine and Nuclear Winter: Climatic Effects of Nuclear War, Catastrophic Threats to the Global Food Supply. Thanks very much Helen for inviting me. This work was done in collaboration with a number of other people. Particularly, most recently, Michael Mills and Brian Toon and Lili Xia. So here’s our beautiful planet (stretched somehow by the computer here). 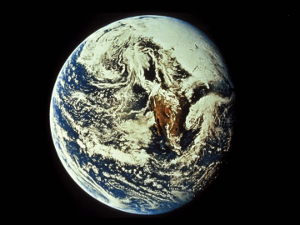 After a nuclear war it might look like this with a cloud of smoke covering the Earth, blocking out the Sun, and making it cold and dark at the Earth’s surface. And what could cause this—Ted showed you what a blast over New York City would do, but he didn’t show the next step which is the fires that would result and put smoke in the atmosphere. There are two types of targets: nuclear air bursts and ground bursts. The cities would burn and firestorms would build. Ground bursts also produce dust and in one case the sunlight gets absorbed and in another case it gets reflected. But that means very little sunlight would reach the ground. And that would cause rapid, large drops in surface temperature. This would be devastation to agriculture and natural ecosystems. The smoke in the atmosphere also heats the upper atmosphere which then destroys ozone and that would mean a lot more ultraviolet radiation reaching the ground; also which would be devastating for life. 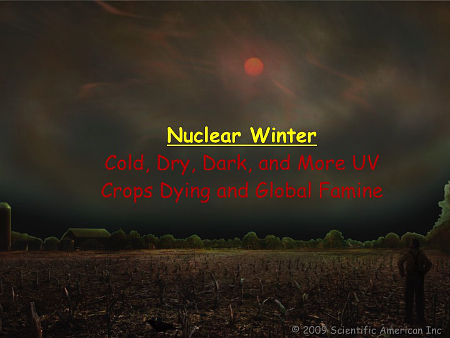 So this produces what we call Nuclear Winter with cold, dry, dark conditions at the surface, more ultraviolet-producing, crops dying, and global famine. 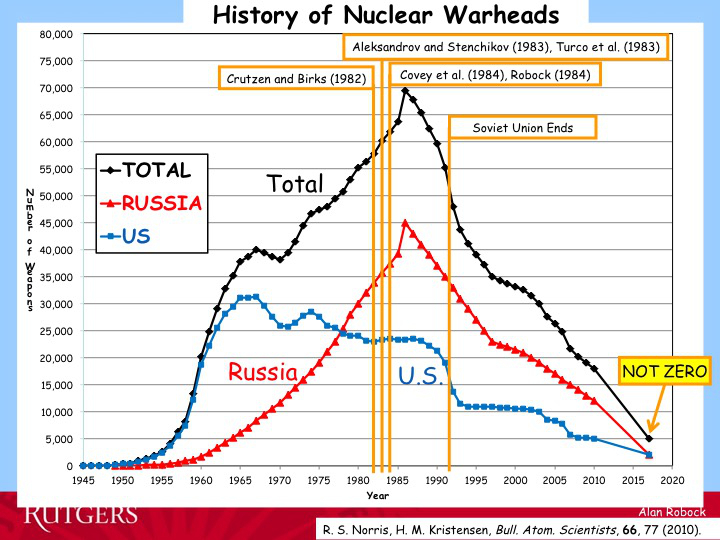 Max just showed a version of this graph showing the total number of nuclear warheads. The first idea of this was a paper by Paul Crutzen and John Birks [Crutzen, P.J. ; Birks, J.W. (1982). “The atmosphere after a nuclear war: Twilight at noon”. Ambio (Allen Press) 11 (2/3): 114-125]. 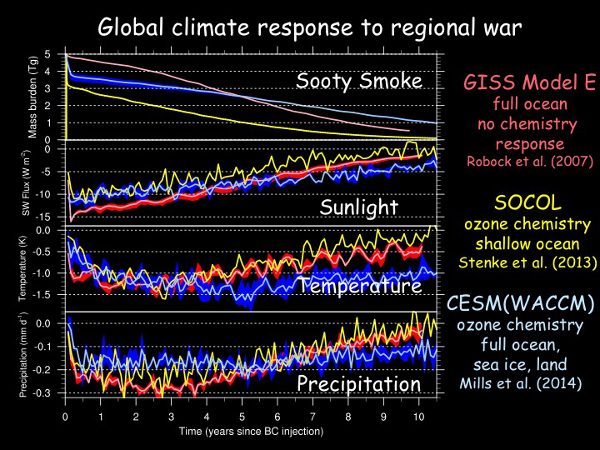 Then climate model simulations of the response were done by both Russians—Aleksandrov and Stenchikov [Alexandrov, V. V. and G. I. Stenchikov (1983): “On the modeling of the climatic consequences of the nuclear war,” in The Proceedings of Applied Mathematics, The Computing Center of the USSR Academy of Sciences, Moscow, 21 pp. ]—and Americans, Turco et al [R.P. Turco, O.B. Toon, T.P. Ackerman, J.B. Pollack, Carl Sagan: “Nuclear Winter: Global Consequences of Multiple Nuclear Explosions,” Science 23 December 1983: Vol. 222 no. 4630 pp. 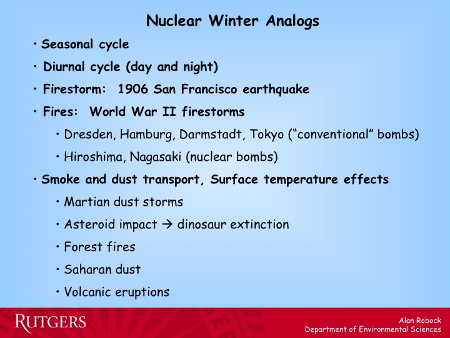 1283-1292], and I published a paper the next year showing the long-term effects [Robock, Alan, 1984: “Snow and ice feedbacks prolong effects of nuclear winter.” Nature, 310, 667-670]. The nuclear freeze movement was going on at the same time as Helen described. And then the nuclear arms race ended. And this science was part of the story of why the nuclear arms race ended. 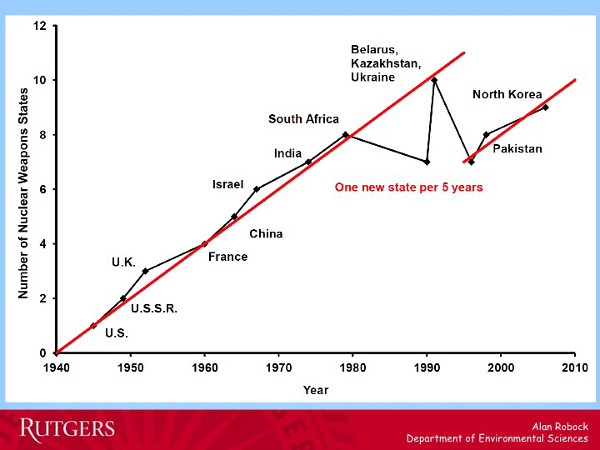 The Soviet Union ended 5 years later so it wasn’t the end of the Soviet Union that ended the arms race. I’d also like to point out that the number by 2017 is not zero. We still will have 5,000 nuclear weapons on the planet and that’s still enough to produce nuclear winter so the problem has not been solved. Why do I think we scientists had a role? 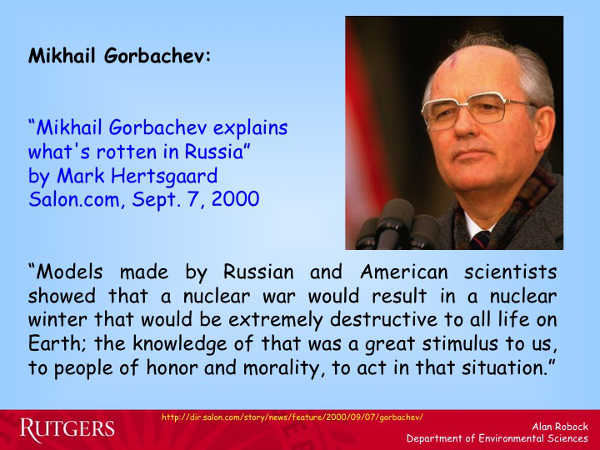 You can ask the people that made the decision: Ronald Reagan and Mikhail Gorbachev. So both these men who made the decision had this information from both Russian and American scientists telling them the same story. That was a powerful message. And in the United States people said, Why do we care about climate effects, we’re all going to die anyway from a nuclear war. Wait, we’re all going to die. And it made people really focus on the direct effects too and the craziness of the increase of the nuclear weapons. That was 30 years ago. Why am I even telling you about it? I want to ask 2 questions. The Cold War and the arms race are over. 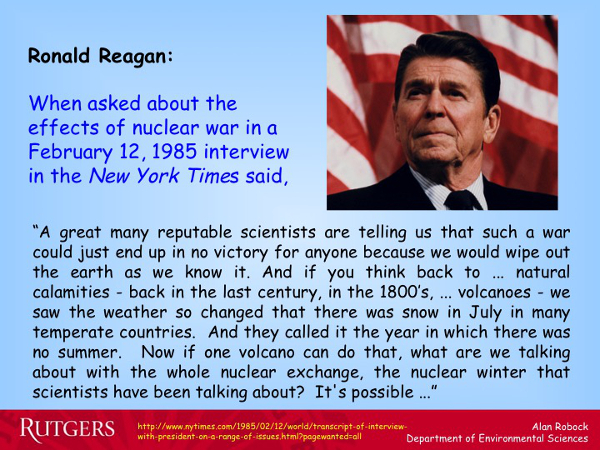 Could the remaining nuclear arsenals still produce nuclear winter with temperatures below freezing? And now there are not just 2 nuclear nations, there are 9. 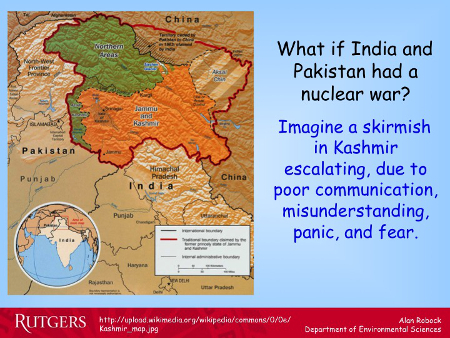 What if a couple of the new nuclear nations, say India and Pakistan had war on the other side of the world, how would that effect us? The answers to these questions are, Yes the current arsenal can still produce a nuclear winter and will last much longer than we thought—decades. 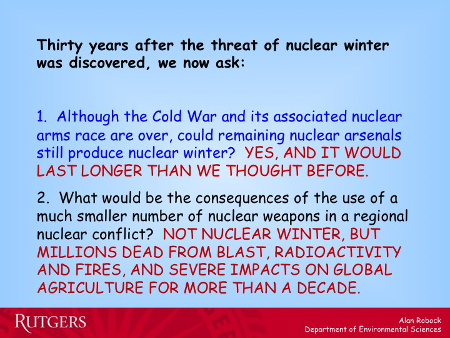 And a small nuclear war would not produce winter—that is the temperatures wouldn’t get below freezing—but it would be terrible direct effects and there would be severe impacts on global agriculture for more than a decade. 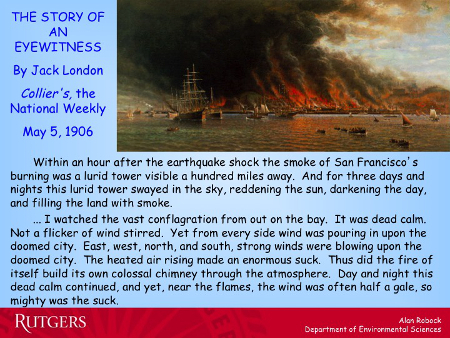 And it produced a firestorm and pumped the smoke up into the upper atmosphere. This is what San Francisco looked like afterwards. All of the buildings were gone except for some of the stone ones. 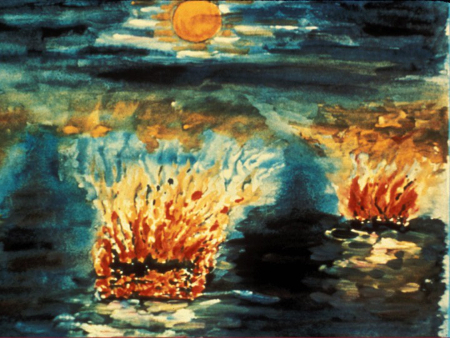 This is what one of the survivors of Hiroshima remembers which is the smoke and the fires. And this is what Hiroshima looked like afterwards. So we have this example of cities burning and producing smoke. The number of countries with nuclear weapons has increased about 1 every 5 years until the Soviet Union broke up and we have 2 more since then and now we have 9 nuclear nations. 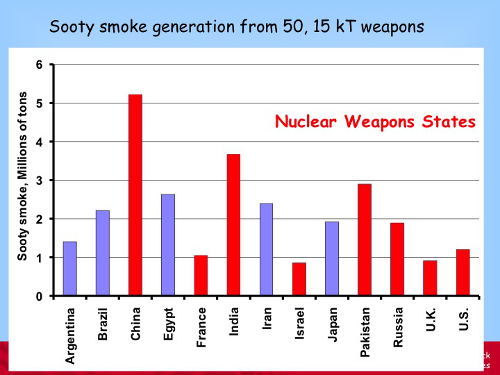 There are about 16,400 nuclear weapons in the world now as of August 2014. The graphs show the different [types]—the yellow are the ballistic missiles which are on hair trigger alert. Russia has about 8,000. The US about 7,000. All these other countries have a couple of hundred. Why did they stop? Why do they only have a couple of hundred? How many nuclear weapons do you have to put on your enemy to deter them from attacking you? One. Okay, maybe two if the first one doesn’t work. So why do we still have thousands? The US and Russia could immediately go down to 200 each and not lose any of their deterrent ability even if it were a deterrent. Max talked about—Ted also—about how close we’ve come several times. What about this time? Imagine you’re Pakistani Air Defense and you see an attack coming in over the horizon. You’re a nuclear nation. Who do you think would be attacking you? Would you guess it was the United States or maybe you’d think it was India. 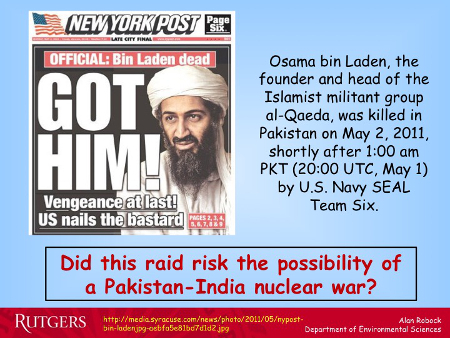 So did we almost start a nuclear war by going to get Osama bin Laden? We didn’t, fortunately. 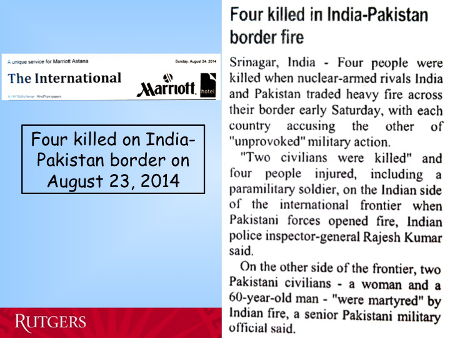 But along the Kashmiri border, there are always disputes between Indians and Pakistanis. Imagine a skirmish there escalating due to poor communication, misunderstanding, panic, problem with the computer. This happens all the time. We’ve been really lucky that, again, this hasn’t escalated into something worse. So we decided to look at what the climatic effects of such a war would be. 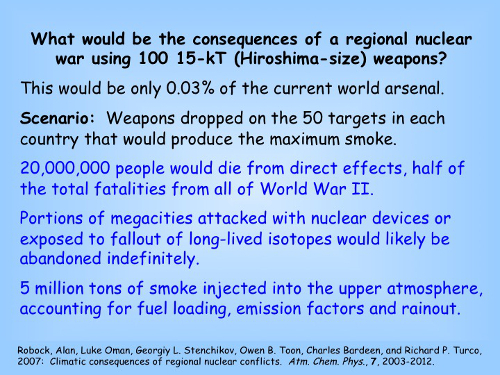 We took 50 Hiroshima-size weapons and put them on the 50 targets in each country that produce the largest amount of smoke. For India this would produce 3.5 million tons of smoke. For Pakistan, 3 million tons—6.5 million. We said, Let’s be conservative; let’s put 5 million tons of smoke into the upper atmosphere and see what the climate response would be. This is much less than even 1 percent of our current global nuclear arsenal; 0.3 percent. Of course it would be a terrible direct effect. 20 million people would die directly. Here’s a movie of where the smoke would go. It would be heated—this is the tropopause. Most of it would be heated and go up into the stratosphere, the region above where there is weather so there wouldn’t be any rain to wash it out and it would last for more than a decade, and it would cover the whole world. 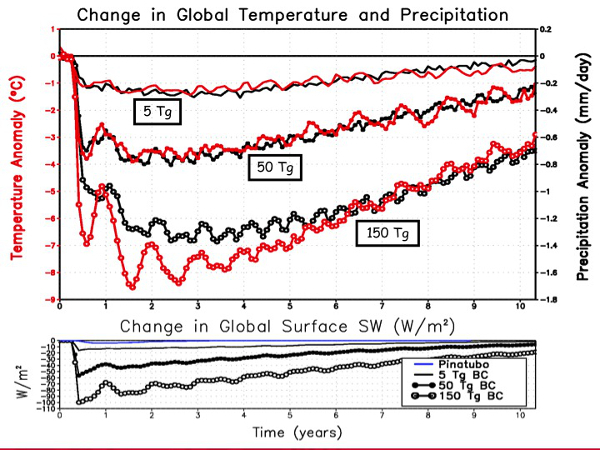 If you graph the climate response on a graph of global average temperature: blue is the global warming we all know and love which I spent a lot of time working on; the red would be the global temperature change. So it would be a couple of degrees colder. It wouldn’t be winter temperatures. But this would be the climate change unprecedented in recorded human history. Colder than the little ice age. 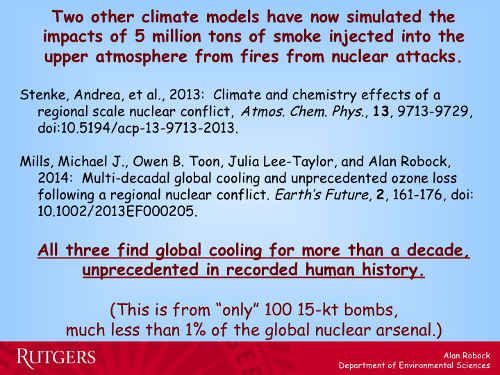 Two other climate models have recently done a similar calculation to make sure this is not dependent on one climate model. All three found basically the same result. This is the climate model at the National Center for Atmospheric Research (NCAR) which is much more detailed and also includes the effects of ozone. [Here are two additional movies made by Michael Mills. Alan Robock had asked him to make another version with a white background and progressive shades of grey leading to black for the highest concentrations so it looks like smoke. The first animation is in greyscale and runs at 10 frames per second. The second animation version runs 5 frames per second.] 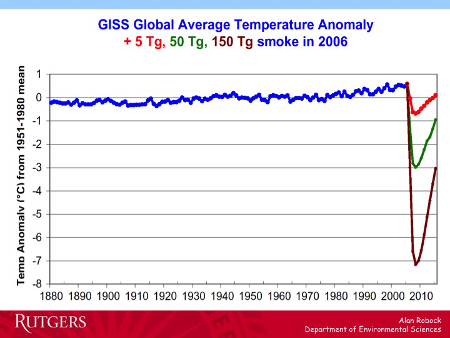 The smoke goes up, it gets heated and goes up into the upper stratosphere and it stays there for years. The sun heats it and this is in April. As you get to summer it goes to the northern hemisphere heated by the sun. And then it goes into the southern hemisphere when it turns winter and stays there for a long time. We can calculate how long it stays there. Our first calculation showed that the temperature would go down by 1.5 degrees Celsius, about 2 degrees Fahrenheit. The Swiss model showed similar results. 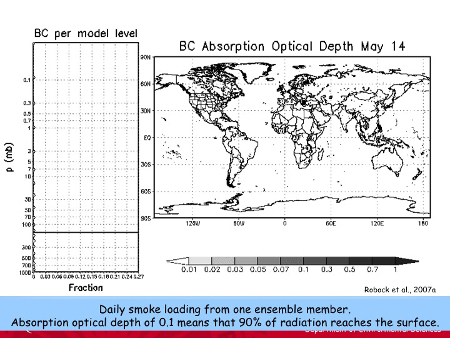 The NCAR model had the smoke last longer. It calculated more detail in the stratosphere and actually it would last for a couple of decades. Alright, so a couple of degrees. What does that mean? We said, Let’s take this and let’s go to places where they grow food and apply the change of temperature, the change of precipitation, the change of sunlight, and calculate how crops would grow. 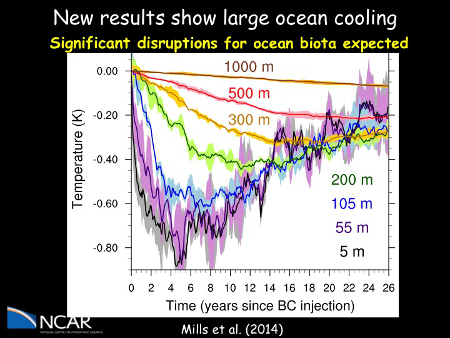 There would also be cooling in the ocean. First of all the ozone would be depleted. Now we worry about the ozone hole around Antartica. 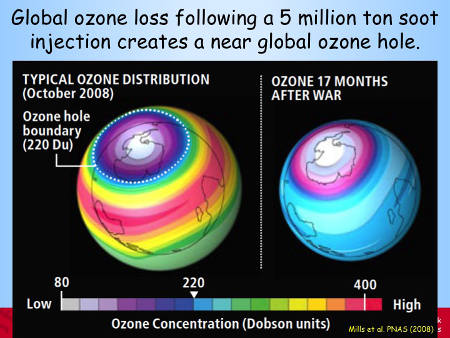 This would be a global ozone hole with excess ultraviolet. 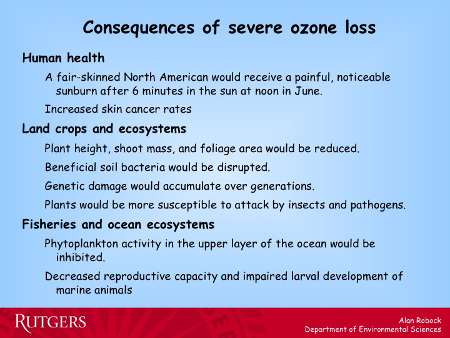 We haven’t even had time yet to look at the impacts of the UV. 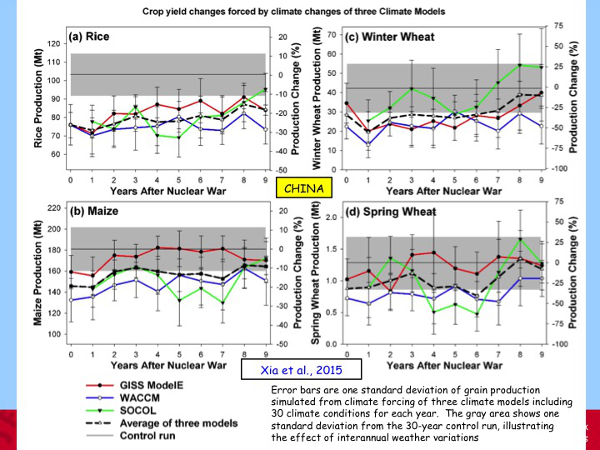 This is a graph from our analysis using all of those three climate models looking at how the production of the main food crops in China, the country that grows the most food, would change. This is for 10 years. For rice it would be down by 20 percent. For winter wheat, 40 percent. And this is only in the first decade. Let me summarize this in a table. In the US, corn would go down by 20 percent, soy beans 15 percent, rice would go down by 25 percent in China, wheat by 40 percent. This means the same amount of food that was grown in China when they had several 100 million fewer people. And it would last for more than a decade. You can imagine people hoarding food, world food trade collapsing. And now we’re analyzing every crop in every country so we can go for the whole world and tell no more chocolate for you, no more wine for you. People can really have a gut feeling of how it’s going to affect them. Not somewhere else in the world. But the story—it’s much worse than that. Forget about what I just—it’s much worse than that. 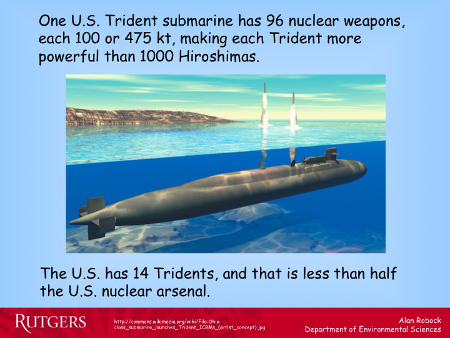 Because as Ted mentioned, every Trident has 100 nuclear weapons and they’re much more powerful than the Hiroshima bomb. So each Trident submarine can produce about 1,000 Hiroshimas and the US has 14 of them. And that’s only half of our arsenal. And Russia has got the same size arsenal. So we could produce much, much, much more smoke if we used them. So we did a simulation of what would happen if the US and Russia had a nuclear war. And [there would be] a lot more smoke. It would go up in the atmosphere and cause much more temperature change. 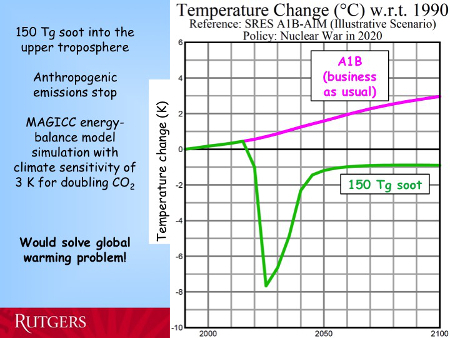 Now I’m going to graph the global temperature change. In the 5 terragram case I first showed you is up at the top here. I’ve had to re-scale the graph. Now for 150 million tons of smoke, 7 or 8 degrees Celsius colder. Colder than the Little Ice Age. 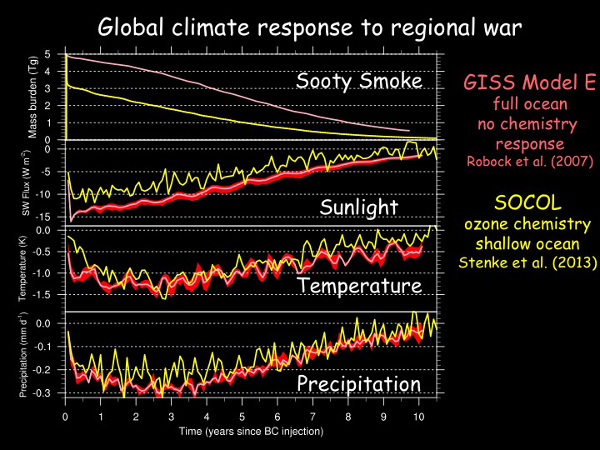 This is the same amount of smoke that we put in the atmosphere when we were studying nuclear winter in the 1980s using a third of the-then much larger arsenals. We were trying to figure out, How can you still get so much smoke? It turns out, with a third of the arsenal, every possible target in Russia and the US had 9 nuclear bombs targeted on it. Because they put one on. Okay, let’s put two on in case it doesn’t work. So we have this huge pile of weapons, Okay let’s bounce the rubble. Now if we just put one on each target we can still produce the same amount smoke even after the new START agreement is in effect. 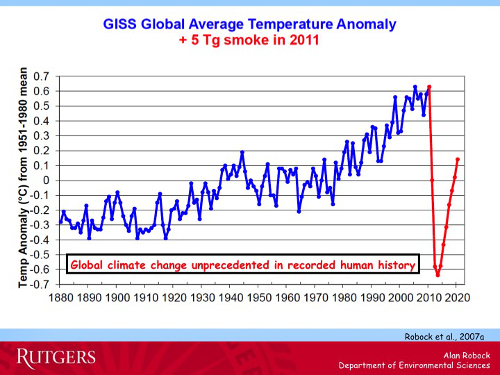 If you look at global warming then, [laughs], this huge impact. What’s new in this work? A nuclear war between any nuclear states using much less that 1 percent of the current nuclear arsenal could produce climate change unprecedented in recorded human history. 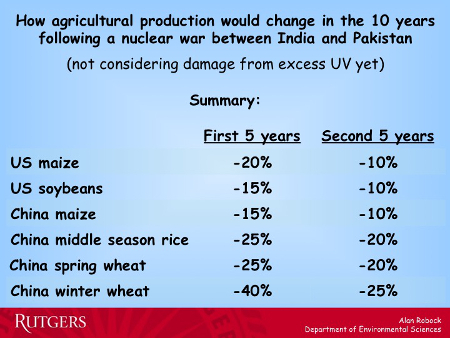 Such a “small” nuclear war could reduce food production by 20 to 40 percent for a decade. 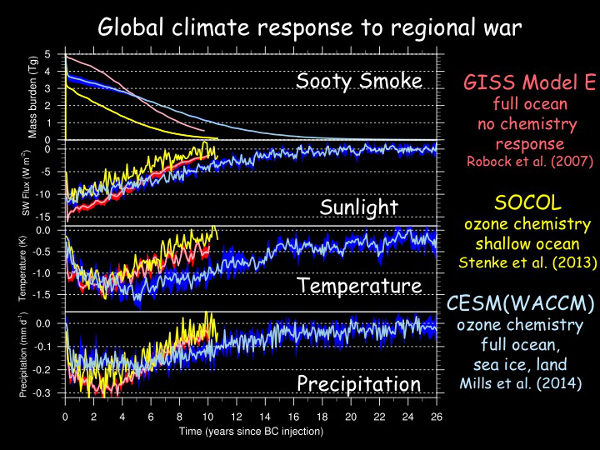 And we’ve repeated the nuclear winter calculations done in the 1980s about which there was some doubt about well do you really get temperatures below freezing? It turns out nuclear winter theory was correct. In the current arsenal, the Russian and American one can still produce temperatures below freezing and the effects would last for more than a decade. Now we have modern models that can heat the smoke, take in the upper atmosphere and calculate how long it would stay there. In the 1980s the climate model simulations were done on a Cray-1 Computer which is much less powerful than your iPhone in terms of its computing capability and storage. Now we have modern computers that can do this much better. Everything I’ve told you so far is theory. It’s based on models. 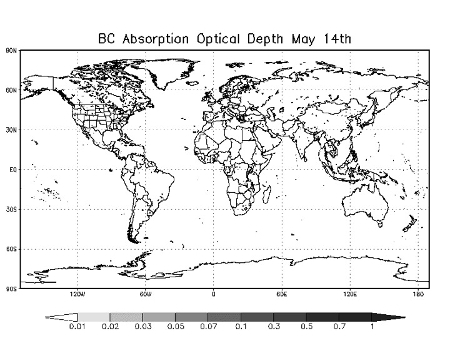 The same models we use to do weather prediction and climate model simulations. How do we test this theory? We don’t really want to do it in the real world so we use analogs. We use things that inform us about parts of the story. We know it gets cold in the winter. Why is it cold? Less light, less energy—the days are shorter, the sun is not as intense. So we have a feeling for how cold it can get. If you turn off the sun we know it gets cold at night time. Unfortunately we have examples of cities burning both in San Francisco and during World War II with so-called conventional bombs, which makes it sound like it’s okay. 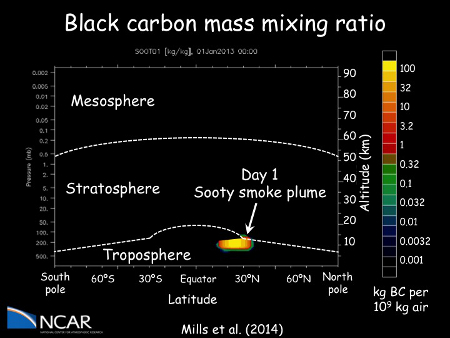 And we have examples from Volcanoes and Martian dust storms of this dust and smoke being transported around the world and causing cooling. Now, what should we do about it? President Obama and President Medvedev signed the new START Treaty in 2010. 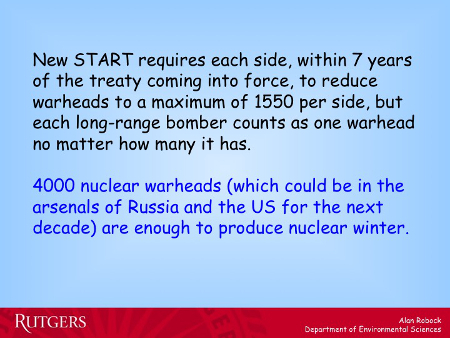 And that pledged that within 7 years each side would bring their nuclear warheads down to 1550 per side. But strangely each nuclear bomber counted as one nuclear weapon because they couldn’t tell how many bombs there were inside of them. So maybe that means each country will still have about 2,000 nuclear weapons. 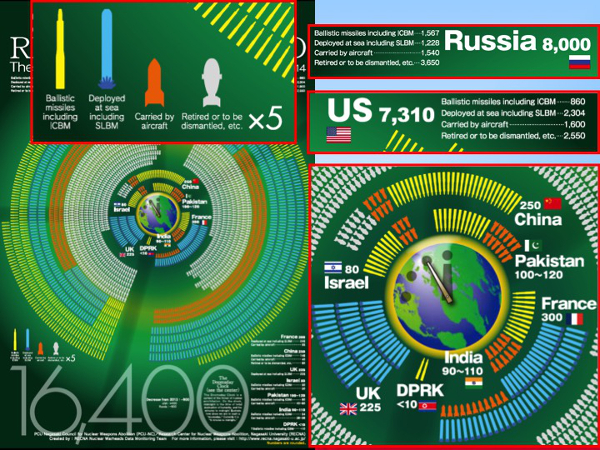 So that’s 4,000 nuclear warheads altogether, and maybe another 1,000 in the rest of the world. What are the policy implications then? 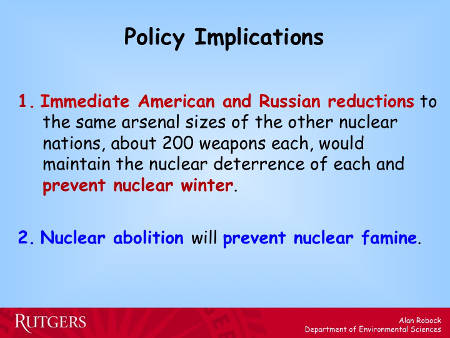 Immediate American and Russian reductions to the same arsenals of the other nuclear nations—about 200 each—would prevent nuclear winter. We wouldn’t be able to produce enough smoke to actually cause temperatures to go below freezing and sentence the entire world to famine. But if we want to prevent the famine that will result, maybe a billion people would die from a war between India and Pakistan because of cutting the food supply then we have to get rid of all the nuclear weapons. 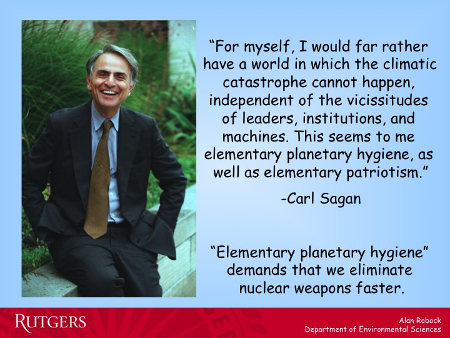 So “elementary planetary hygiene” demands that we eliminate the nuclear weapons much faster than they are being eliminated now. 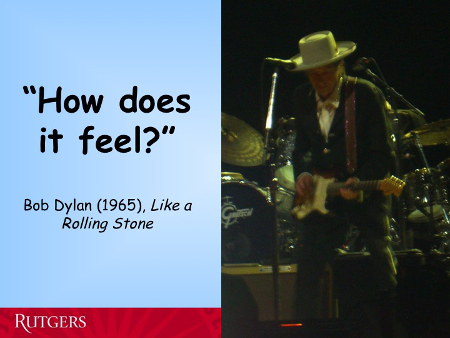 So how do you feel? I’m really sorry to bum you out about this. To tell you about all this. I guess you paid to listen, though. So, what can you do about it? 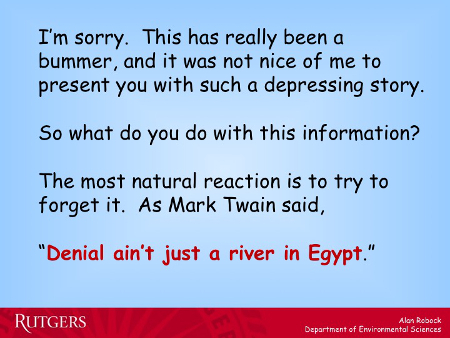 Mark Twain said, “Denial ain’t just a river in Egypt.” It feels good psychologically to pretend you didn’t hear what I just said and go home and pretend it doesn’t exist. And most of the world does that. Helen calls that psychic numbing. But another action is to try and do something about it to get rid of the weapons. 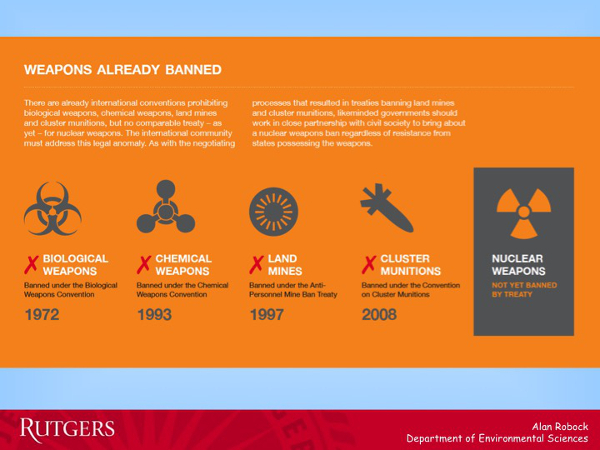 We’ve already banned biological weapons in the world, chemical weapons, land minds, and cluster munitions. But the worst weapons of mass destruction of all—nuclear weapons—have not been banned. So the ICAN is the International Campaign Against Nuclear Weapons, is working to actually ban nuclear weapons. Max mentioned Dr. Seuss. 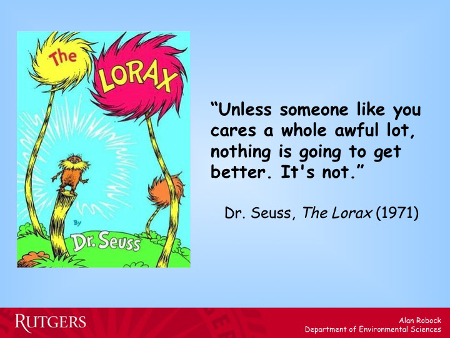 I’ll just end with another quote from Dr. Seuss.